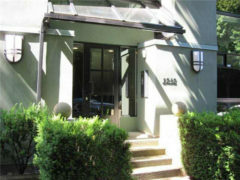 Best value 2 bedroom, rainscreened, freehold strata unit in the West End! Don’t miss out on this fabulous deal! This terrace apartment condo is not ground level and has 775 sq.ft. of living area plus covered balcony. Practical pluses include: secure underground parking, low maintenance fees $230/mo, new carpets throughout, and ready to move in. And yes, your new home is only 1 block to English Bay Beach Park. View photos online and call for a showing before this unit is sold.